LDP, Cruising, DH, Freeride. Sold in sets of FOUR wheels. A favorite among elite LDP riders worldwide for its speed and acceleration. The Seismic Blast Wave is 78mm tall by 50mm wide, with a radiused outer lip for high grip with controlled sliding. It’s molded around the full version of our proprietary Energy Conversion (EC) hub – the first tall, wide hub seen in longboarding and still second-to-none. Astoundingly light, responsive, and versatile for a wheel of this size. Seismic and 3dm wheels are poured at the world’s leading wheel factory, using the world’s finest urethane. We’ve conducted extensive lab tests that subject wheels to extreme stresses as they roll on a smooth drum simulating a uniform road. Our wheels never tear or chunk under these lab conditions. But chunks and tears are an ever-present risk as flexible urethane wheels roll, turn, and slide on imperfect surfaces in the real world. Even the best auto and bike tires can go flat if they roll over nails or glass. 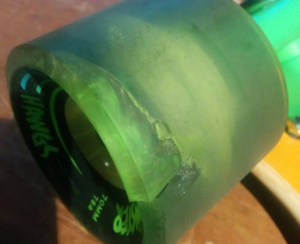 Likewise, even the best skateboard wheels can tear on nails, glass, gravel, pebbles, and small sharp residue on roads that otherwise seem smooth. In both cases, the damage is almost always a matter of physics and bad luck, not product defect. Probably only wheels made of steel would be 100% resistant to tears and chunks! Seismic follows the basic protocol of the auto and bike industries. We evaluate each report on its own merit, and we sometimes replace torn wheels on a courtesy basis. But we usually don’t warranty wheels damaged by sharp surface elements without very clear evidence of product defect. A tear that runs along a significant portion of a wheel’s circumference (see photos above) is clear evidence that damage occurred as the wheel rolled or slid over a sharp surface element. Harder wheels, and wheels with rounded edges, don’t catch as easily on jagged surface features. Softer wheels, and wheels with sharper edges, are more vulnerable to damage – especially under heavier, faster, and/or more aggressive riders. High-rebound race formulas (like Seismic Defcon™) are somewhat more vulnerable to tearing – their faster rate of energy return is only possible because they have an inherently “looser” molecular structure. But experienced racers generally agree that the added speed is worth it. Very tall, narrow race wheels (like the Seismic 85mm Speed Vent) may be more vulnerable to tearing and chunking, for at least two reasons: 1) The longer “lever arm” between the axle and lips amplifies forces acting on the edges; and 2) Those forces are not distributed across a wide contact patch. Before skating any new setup for the first time, you should always test on carpet for the possibility of wheel rub. 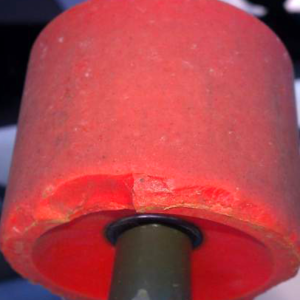 Wheel rub is a “systems issue,” related to the total deck-wheel-truck combination. The manufacturers of individual components can’t guarantee that you won’t get wheel rub when combining their product with parts from other companies. The axle height and tilt range of Seismic trucks were carefully engineered for maximum performance options. If you’re experiencing wheel rub, your best solution is to use more riser under your trucks, and/or smaller wheels, and/or a deck with wheel wells or wheel cutouts. If your bodyweight is on the high side, another issue to consider is torsional deck flexion. Under the weight of heavy skaters, decks twist more than normal. This means that the deck actually flexes toward the wheels during turns (especially at the nose), making wheel bite more likely. Extra-large skaters should consider choosing stiffer, thicker decks, possibly with concave, to gain more torsional stiffness. Wobbly wheels (wheels with misaligned cores) show up now and then, no matter what brand you’re talking about. It’s just a fact of life, even with the most modern technologies used to mold skateboard wheels. Of course, we do our absolute best to minimize the number of wheels that are wobbly. Wheels with significant wobbles – with cores so out of alignment that performance is effected – are rare. Unfortunately, we cannot entirely eliminate wobblers and still offer wheels at prices that most skateboarders can afford. If one out of four of your wheels seems to have a significant wobble, you got very unlucky. Please contact us about the wobble (or other defect) before riding the wheels, and we’ll work with you to figure out what’s up. If the problem is real, we’ll take care of it. Just note that if you have a genuinely bad wheel, we will replace the problem wheel but not the whole set of wheels. We make no exceptions to this policy. Also, if you’ve logged a lot of miles on the wheel, it’s too late. A well-worn wheel is one that you got your money’s worth from! The odds are incredibly low that two or more of your wheels have a significant wobble. If you think you have more than one wobbly wheel, you may be expecting too much. Aerospace tolerances are impossible to deliver at affordable prices. Miniscule wobbles – the type that you have to strain to see, the type that you can’t notice in any way when you’re riding – are common and do not effect performance. In fact, they normally disappear or diminish as wheels break in. If you’re unsure about one or more of your wheels, first check to make sure you have bearing spacers of the correct size (0.400-inch) installed between the bearings. Bearing spacers help keep the bearings aligned in the wheel core; neglecting to use them can make good wheels appear wobbly. Also note that appearances can be deceiving. Even with good bearings and bearing spacers, some wheels with perfect core alignment may look wobbly when spun by hand. How is this possible? When wheels are popped out of the molds, the urethane sometimes settles unevenly as it cools, leaving small excesses around the edges. Also, sometimes the “flash” (excess urethane) on the inside lip is trimmed off unevenly after molding, creating an edge that appears to wiggle as the wheel spins. These two factors – uneven cooling and asymmetrical trim – can make good wheels appear wobbly when free–spun. To distinguish these from true wobblers (wheels with misaligned cores), look at the inside and outside edges separately during a spin test. In a true wobbler, the inside and outside edges will oscillate with a perfectly even rhythm, and the middle of the wheel will probably not stay level. Wheels with high spots, or wheels with an uneven trim, will usually show only one edge wobbling during a spin test. If a wheel has multiple high spots, both edges may look wobbly, but the middle usually stays level and the oscillation will not have an even rhythm. Again, such wheels are generally perfectly fine to use. Seismic wheel hubs are made of the strongest composite material available in the industry. But under extreme stresses, even the best skateboard wheel hubs can deform or even melt. Three factors are almost always at play: damaged or seized bearings; the absence of spacers supporting the bearings in their pockets; and loose wheel nuts. Bearings that are damaged or seized may appear to spin OK at rest, but in a mater of seconds they can reach over 400° F, hot enough to melt or deform virtually all molded plastics. For optimal performance, use Seismic Tekton bearings, or else normal bearings with proper spacers between them. Otherwise aggressive high-speed carves and hard slides over-stress the hub bearing supports and the bearings themselves. The bearings can easily suffer damage, making them more likely to seize and create enough heat to melt any hub on the market. Axles with poor diameter tolerances only make these matters worse. In addition, if your wheel nuts are not tightened snug against the bearings, your wheels lurch on the axles every time you carve or slide. This means the bearings slam back-and-forth against the hanger and the nut. Over time, the repeated impacts over-stress the hub bearing supports, especially if you’re not using Tekton bearings or normal bearings with good spacers. The bearings themselves will also suffer damage – leading to noise, diminished performance, and a greater likelihood of seizure. Unfortunately, if you ride without bearing spacers and/or with loose wheel nuts, Seismic cannot warranty wheels with damaged hubs. For optimal performance, keep your wheel nuts snug and use Seismic Tekton bearings. Their integrated flanged spacer elements assure optimal alignment and support during even the most aggro riding.